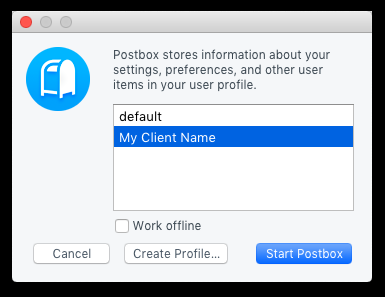 I use Postbox, the Mail Client as a tool for checking problems with customer’s email accounts, and migrating mail data. When I have finished using it I don’t want to retain their data, nor do I want it taking up space on my machine. Just removing the ‘accounts’ doesn’t actually remove the data, it sits in Application Data forever (well maybe not forever, but a long time). While searching for the location of stored mail data, I chanced across the Postbox Profile Manager. This allows complete profiles to be added and removed. Preferences > General > ‘Show Profile Manager on startup’ (tick checkbox). From here you can right-click on a profile name to delete the profile. Beware: Deleting a profile removes all the account data stored in it. 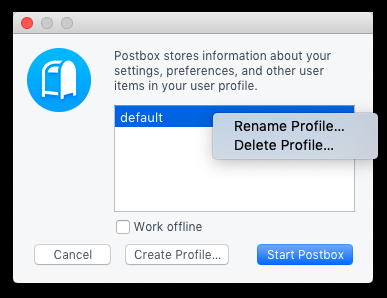 If the deleted profile is the main/default one, Postbox will think it’s just been installed and prompt you for account data at next startup. If not, please leave questions, comments or corrections below.